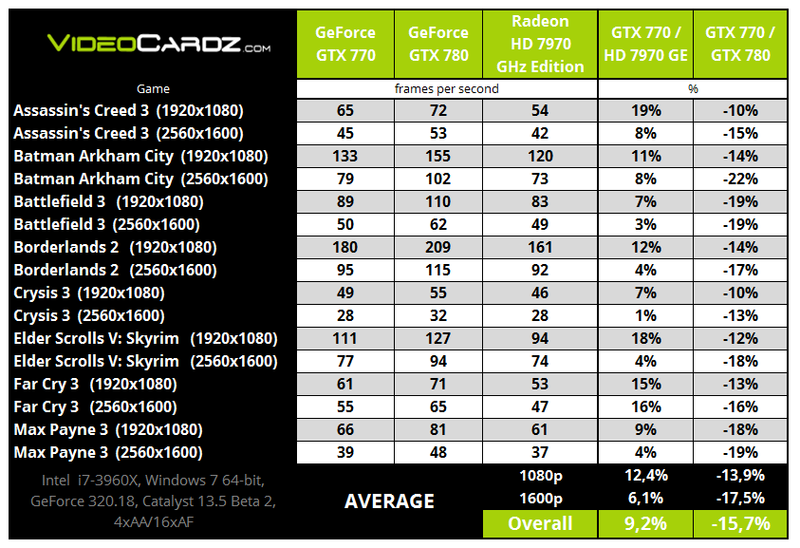 NVIDIA would introduce their latest GeForce GTX 770 graphic card this week on 31st May 2013 but thanks to Videocardz, we get to see some official numbers of the card straight out of the GPU’s slide deck early. Incase you missed out the unofficial benchmarks, you can check them out here. 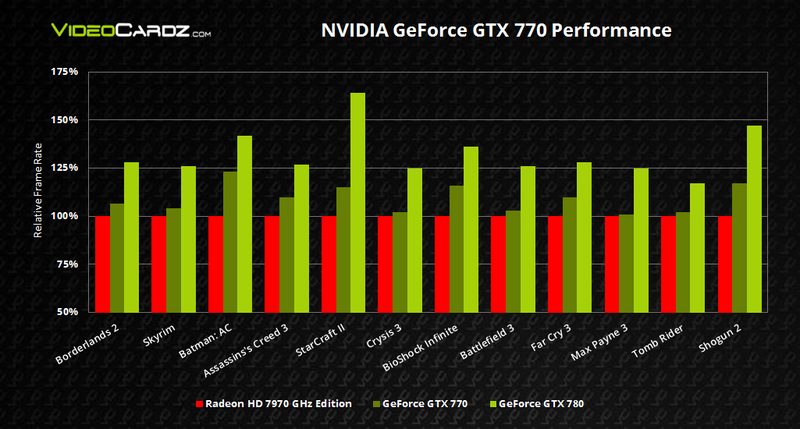 The GeForce GTX 770 would make use of the GK104-425-A2 GPU that features 1536 Cuda cores, 128 TMUs and 32 ROPs along with a 2GB GDDR5 memory that operates along 256-bit interface. From previous reports, we know that the reference models would be clocked at 1046 MHz core and 1085 MHz boost while the memory would be effectively clocked at 7 GHz which would give a good performance boost over the GeForce GTX 680. Unlike the GeForce GTX 780 which would be restricted to reference models at launch, the GeForce GTX 770 would be made available in both reference and non-reference models. Some manufacture’s would stick to the reference GeForce GTX 680 coolers to cut down the cost or use the NVTTM Titan cooler on the reference card. We know of atleast one model which comes from MSI that uses the custom Lightning series design while the one tested by the forum member here is another non-reference model. 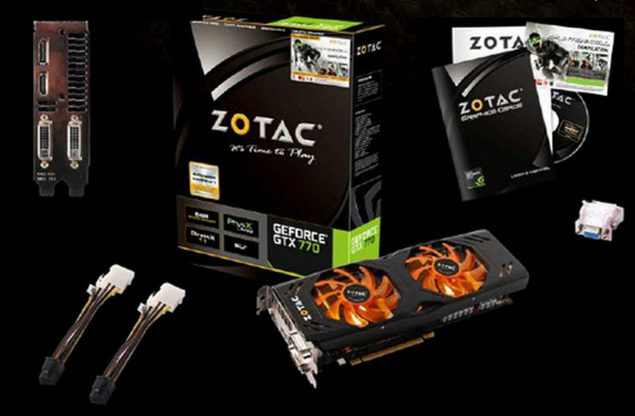 Before we go and take a look at the performance, i’d like to mention that a listing of the ZOTAC’s GeForce GTX 770 has been revealed which show it equipped with a dual-fan cooler and is clocked at 1059 MHz core and 1098 MHz boost while memory is clocked effectively at 7010 MHz. 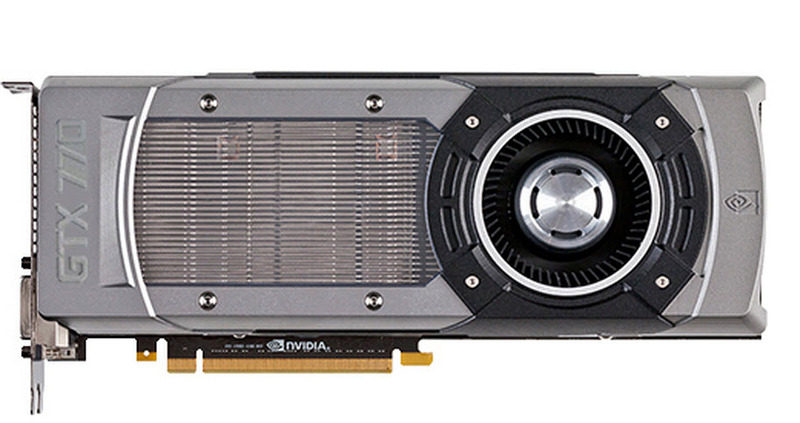 The GeForce GTX 770 would indeed go on sale for $449. 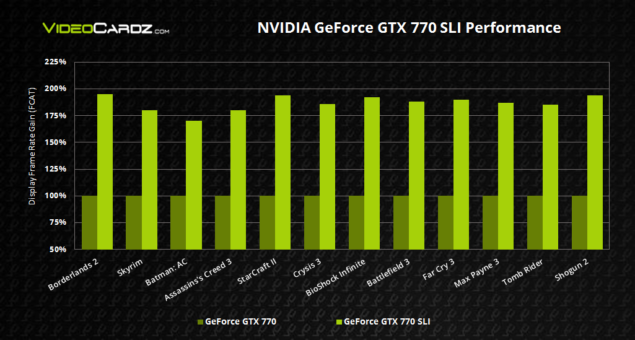 The GeForce GTX 680 made use of HY ROC particles for memory which limited its overclocking limit upto 7.2 GHz max. The GeForce GTX 770 makes use of the HY R2C particles which can extend the overclocking limit so that at reference the GPU can be shipped at a clock speed of 7 GHz while allowing an on air OC of upto 8.00 GHz. The card tested makes use of a reference PCB but makes use of a tri-fan cooler that will improve its temperatures.